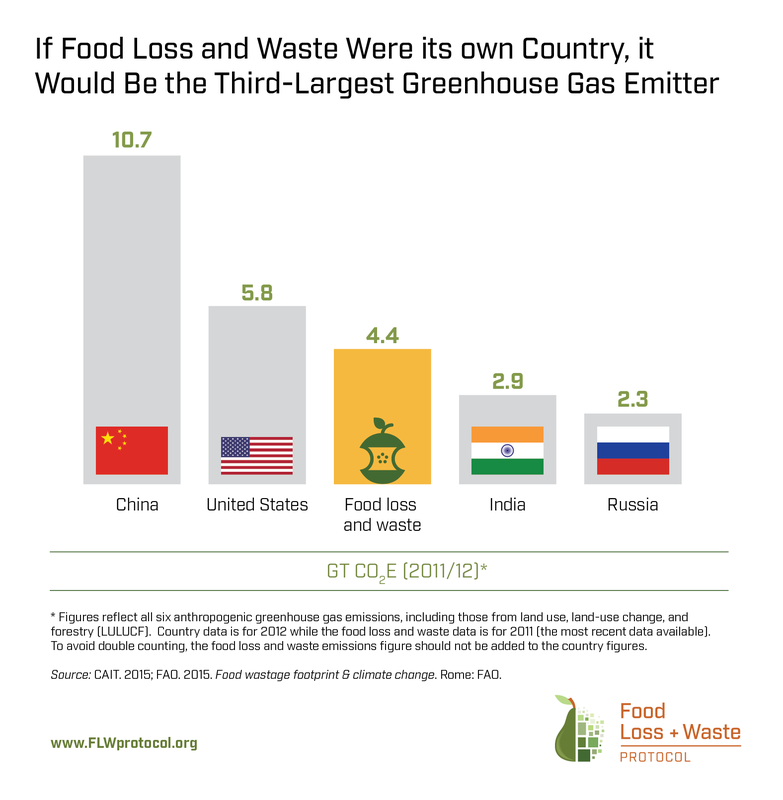 There are many good reasons to reduce this loss and waste—food security, economic gains and environmental sustainability, just to cite a few. But many of those most capable of fixing the problem, like governments and businesses, don’t know where to begin. About 1 out of every 9 people globally is undernourished, meaning they don’t get enough to eat on a daily basis. Reducing FLW could be an important strategy in making more food available without needing to increase production. According to WRI analysis, cutting the rate of food loss and waste in half could close 20 percent of the nearly 70 percent “food gap” between food available today and what will be needed in the year 2050 to accommodate a larger population. And in developed countries, where FLW tends to occur closer to the consumer, increased donation efforts by companies can help food banks and similar charities in their efforts to feed the hungry. Governments can encourage these donations. In France, the Senate passed a law requiring supermarkets of a certain size to donate their excess food, while in the United States, the “Good Samaritan Law” legally protects food donors from legal liability relating to any potential harm from donated food. These global implications may seem abstract, but the environmental benefits of reducing can be felt at the local level. For example, due to the methane generated by FLW and the amount of land needed for landfill facilities, multiple states in New England have instituted bans on sending food waste to landfills. This presents an opportunity to use FLW in other ways. For example, composting facilities turn FLW into a nutrient-rich soil supplement that creates better crop yields, and anaerobic digesters create biogas from FLW to use as a more environmentally friendly alternative to fossil fuels. Voluntary standards to reduce FLW are already emerging. The Consumer Goods Forum, which represents 400 companies across 70 countries, adopted a resolution to reduce FLW among its members by 50 percent by 2025, using the FLW Standard to track progress. Target 12.3 of the Sustainable Development Goals aims to halve food waste at the retail and consumer levels by 2030, while also reducing food loss along production and supply chains. Champions 12.3, a coalition of executives from government, business and international organizations, has formed to help achieve that target. And the U.S. Department of Agriculture and Environmental Protection Agency enacted the country’s first national food waste reduction goal last year, calling for a 50 percent reduction by 2030. With global awareness of FLW at an all-time high, it’s time to start making changes in countries, businesses, cities and households. With the FLW Standard, meaningful change is more attainable than ever.